The first official strongman challenge was held in 1977 in Universal Studios, California; but it was no circus act. It was a display of herculean feats, where big, brawny men bent bars and tossed tyres, vying to claim the title of world strongest man. Winners are decided through a point system and the strongmen undergo a series of events in order to rack up points. Contrary to the conventional barbells and dumbbells, events that the strongmen partake in involve implements such as tyres, logs, cars, trucks, and even planes. Events do not consist of just hauling a weight once; some involve lugging loads through courses and lifting ascending amount of weights one after another. Events are usually timed, ensuring that it not only tests their strength, but also their stamina, skill, and strategy. Expect variety in the sport. Events for strongman competitions vary from one competition to another. Take the Loading Race for example, where the strongman will lift five objects, each between 100 to 164kg through a course of about 15 metres to load onto a platform. Objects used differ from one competition to another. Types of weights range from sandbags to blocks of ice and course terrains range from concrete to snow. The first strongman competition in Singapore, HomeTeamNS Strongman Challenge, was held in 2005 and has been held annually ever since. This year’s grand final will be on 6 September 2014 and will feature five events - Tyre Flip, Log Walk, Atlas Stone, Car Deadlift, and the SCDF Red Rhino Pull. Tyre Flip – Competitors have to flip a whooping 350kg tyre along a course of 15 metres. No rolling of tyres here, they have to perform repeated flips to the finish. Log Walk – Participants will trudge through a 10 metre course. In their hands will be two logs, each weighing 135kg that they will grip and carry with them. No more multiple trips for grocery shopping. Atlas Stone – 100 to 160kg stones are used here. Competitors will have to lift the stones onto platforms at about waist level one after another, typically in ascending order. Car Deadlift – No need for weight plates for a deadlift. In the challenge, a 1.6 ton car is loaded on a metal rack for the strongman to perform the good old-fashioned deadlift. 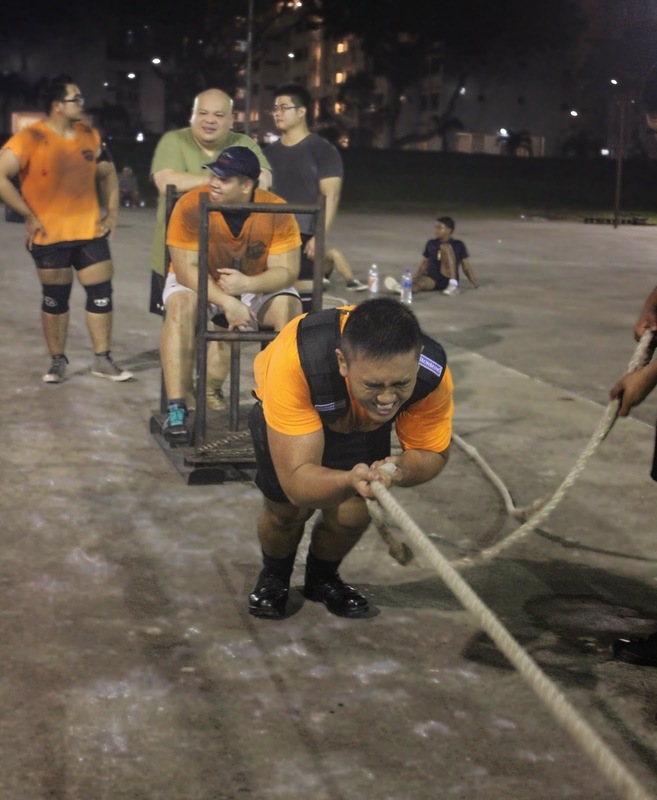 SCDF Red Rhino Pull – The signature of the HomeTeamNS Challenge. The strongmen will battle with the 4 ton Red Rhino as they sling a connecting rope over their shoulders that will help them drag the vehicle to the finishing line. Strongman challenges often introduce local touches to its competitions. For the HomeTeamNS Strongman Challenge, the iconic 4-tonne Red Rhino is used in the Vehicle Pull event and has been a mainstay for the competition. HomeTeamNS Strongman Challenge started back in 2005 and was the first Strongman Challenge in Singapore. Since then, communities of strongman have formed. One of them, SG Titans, has about 300 registered members. The group trains at a mega court in Woodlands twice a week and members perform exercises such as the tyre flip and farmer’s walk. Members do not just include men. Among the Titans are several strongwomen who also share the passion for strength. 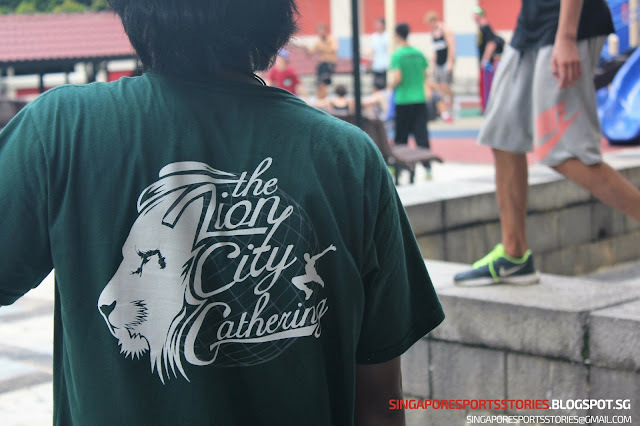 SG Titans welcomes the public to join and promises to burn the muscles, not the pockets; sessions are free.